OXFORD – At the end of spring practices, Ole Miss head coach Hugh Freeze reflected on what he saw from his players and what the outlook is for the 2016 Rebels. Overall, the Rebels’ coach was pleased with what he saw from his squad. Though there were players out for all or part of spring due to injuries—Chad Kelly, Fadol Brown, Issac Gross, Rod Taylor, Tony Conner and Robert Conyers, to name a few—it is only spring, and fall is still months away, meaning Freeze and his staff have some breathing room. The above players should be a full-go once fall camp arrives in August. We missed some kids. I wished we would have had Issac Gross, Tony Conner, Fadol Brown, Robert Conyers, Rod Taylor, Chad Kelly and some of those others to get the reps, but we didn’t. The ones we had out there I know got better. In spite of missing some key pieces to the puzzle, Freeze has many positives to take away from spring—not the least of which is the quarterback position. Freshman Shea Patterson and redshirt freshman Jason Pellerin took over the offense in the final two weeks of spring training as Kelly was recovering from sports hernia surgery. There were times Patterson showed why he’s one of the most talked about gunslingers coming out of high school. He combines the ability to read defenses with a very strong arm, and he showcased both of those assets in the team’s final scrimmage last weekend. 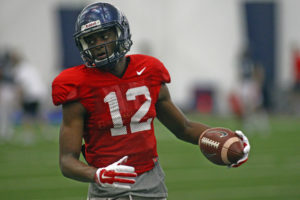 Two of Patterson’s deep balls went to redshirt freshman Van Jefferson, who also impressed Freeze over the course of spring. Jefferson won the Eli Manning Award for most improved player on offense during the spring. Freeze saw tremendous growth in Patterson from the beginning of spring training to the end. “His mechanics are really good; he understands the game. He’s fearless, confident. But, you know, he had a learning curve. In those first few weeks, he had 1,000 different new looks coming at him and different terminology. At the press conference following the final scrimmage of the spring, a local beat writer asked Freeze about the possibility of Patterson seeing the field next season. “That’s so hard to say,” Freeze quickly said. “You certainly don’t want to put him in a position where he plays 10 plays and that’s his season. At the same time, you’ve got to think about the new world we live in. There are a lot of three-and-done type of players. Freeze and his staff were prepared to participate in three satellite camps – two with Oklahoma State in Dallas and Houston, Texas and the other one in Atlanta, Georgia with Missouri – but the NCAA ultimately put a stop to the affair with a ruling by the Division I Council that requires FBS programs to conduct all clinics at school facilities or facilities regularly used for practice or competition. Satellite camps became an issue when Michigan and other Big Ten schools conducted camps in the South region. It’s no secret that Freeze isn’t necessarily thrilled with having a spring game as the current system stands. He recently voiced an alternative to the typical format. “I am a proponent of playing another school at the end of each other’s spring practice,” Freeze said. “Charge five dollars, give every bit of the money after the travel team gets their expenses paid to a charity of choice. I think we will all get a lot out that. Ole Miss opens the 2016 season on September 5th against Florida State in Orlando. Kickoff is set for 7:00 p.m. CT.